Happy Africa Day, Bantu! Today marks the annual commemoration of founding the Organisation of African Unity (OAU), now known as the African Union in 1963. It is on this day 53 years ago when leaders of 30 of the 32 independent African states signed a founding charter in Addis Ababa, Ethiopia. Any plans for the day? Well, here at WO we continue with our #AfricaMonthTalks and this week's edition features none other than Anita Afia Sikutshwa. 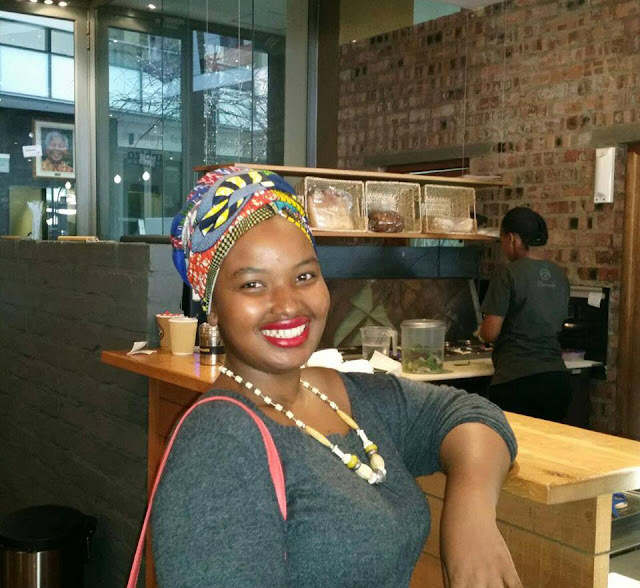 Anita is a pre-30 year-old half South African, half Ghanaian woman, feminist, Pan-Africanist, public (motivational) speaker and social entrepreneur from Cape Town now living in Mthatha, Eastern Cape. Her professional background is in Public Relations, with over 4 years working experience. She admits to have a love-hate freelancing relationship with digital marketing, with love emanating from the fact that it pays her bills. This fierce African woman has recently taken a sabbatical to answer her calling to be a women empowerment speaker. She newly founded The Ubuntu Initiativ, an NGO devoted to uplifting, inspiring and empowering young women from disadvantaged communities. The initiative’s first endeavour as an organization is #PledgeAReusablePad, a project that will train local elderly women to manufacture and distribute reusable pads to underprivileged young women in rural school. The Ubuntu Initiativ will be launching a crowdfunding campaign on Saturday 28th May which also happens to be Menstrual Hygiene Day, to raise money towards the #PledgeAReusablePad initiative and would love your support. To pledge towards the cause, visit their Facebook page:The Ubuntu Initiative. What is your current state of mind about Africa? Frustration. Anger. Love. Happiness. Hope! My mind is undecided, stuck between feelings of not knowing how long it will take for us as Africans to overcome the "dark cloud" placed over our heads and feelings of the unconditional love and pride of how far we have come. But I'm hopeful. It means I have ease of access to the world and the world to me. I try my best every day to remember who I am (the way I dress, keep my natural hair and love myself), my authentic self as a daughter of Africa and live with that knowledge that wherever I am and with whomever I engage with, I carry centuries of power. So the best way to pay homage is to maintain my African identity, especially in the urban sphere. I only engage and share information that is honest, true and not misleading to me or my people. The way I use social media should spark thought in my audience's mind and leave them inspired or somewhat enlightened. What’s your Interpretation of Africa Rising? It is realising our true potential and meeting it. Living our authentic lives and becoming who we need to be in order to blossom our narrative and never comparing with others that do not and have not lived our existence. Africa rising is understanding who we are and developing in that space without fear. There is no succinct identity like the African identity. Even if you have 1% of it, you will always know. The trend right now is to try and look everything but pure African but whether we deny it or ignore it… it is always there and visible. So might as well embrace it. I embrace it every day. Being part of the “African culture” is popular right now and it gives us pride to be Africa. Your views on freedom in the digital era we live in and how do you ensure Your Voice is heard in the digital space? Freedom in the digital era would be being yourself without fear but people take that a bit too far by being fearless and infringing on others' freedom of being part of the digital era such as bullying. It’s great to have freedom in this space but it comes with responsibility that others do not fully understand. My voice is mine and is true to who I am and what I represent (feminism). I do not wish to be heard by everyone but the few that find importance in what I say. My voice is heard when I speak to those who speak to me. Africa Day is a day for those who need a day to celebrate it and learn who they are. I take the day as an opportunity to showcase my pride in my African identity and socialization. It should be a day we spend not only celebrating and accepting who we are, but should also be a day we discuss how to unite and move forward as Africans. The youth today is still fighting for the right to find themselves. We are bombarded by opinions of who we should be and neglect who our authentic selves need to be. There is so much going on that we get lost. We are fighting ourselves more than anything else. Our fight is for unity and that will come when we lose the self we think we need to be and become the self that will aid African unity. We are fighting the fight of self-actualization as Africans. My skin makes me proudly African because it represents Africa at all times. My lineage and the African languages I speak. My family! The food we eat and diversity of our cultures. My hair and the coils that shrink when wet. Everything I am and love about myself and my people makes me proudly African. I am proud of the power I feel every time I’m reminded of my African-ness. Prosperity, love and unity, what more could I possibly ask for? As the girl who always knew she would one day grow up to fit perfectly into her throne as an African queen! A queen is a leader and also a nurturer to her people, but most importantly a feminist!